Posted by Sam Smith on Thursday, August 4th, 2011 at 3:18pm. As the most expensive real estate in the country, Newport Beach is home to many luxury gated communities. If you are wondering which communities are the most expensive in Newport Beach we have the list. Here are the most expensive gated communities in Newport Beach, CA: 1) Harbor Island, 2) Bay Island, 3) Linda Isle and 4) Bayshores. It's not surprising that these communities are all bayfront neighborhoods located in a close proximity to each other. Harbor Island is a private community located in a gate but without a guard attendant. The homes are located facing both sides of the Newport Bay with some of the largest and most exclusive homes in Newport Beach. Currently, there is one double lot for sale for $26,500,000 with direct views of the Newport Bay with 112 feet of frontage that can accommodate a 92+ and a 70+ foot yacht. We have seen listings at high as $38 million in this exclusive enclave of homes. 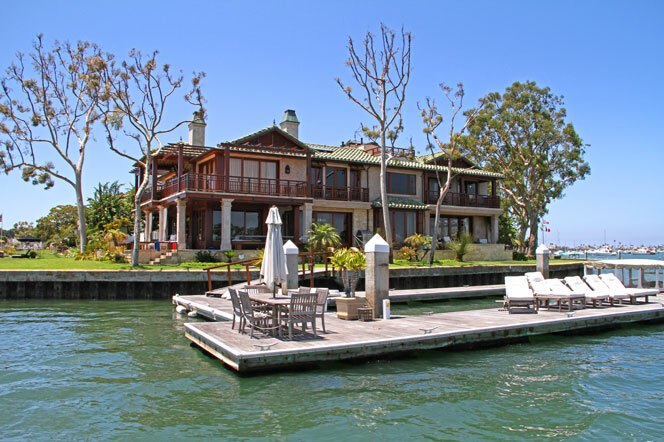 Bay Island is a small island of 23 homes situated on a private island in the Newport Bay. Home prices in the community can range anywhere from $5 million to a recent listing of $27,900,000 for a bayfront home located at the tip of the island. Linda Isle is a guard gated community with homes located in a u shape island with all bay frontage homes priced between $4 to $10 million with previous listings at high at $16,850,000. Finally, Bayshores is very well known for being one of the most exlcusive bayfront communities in Newport Beach. Previous owners include Nicolas Cage and many other Hollywood Celebrities. Home prices in Bayshores will typically run under $6 million dollars with a the previous home of Nicolas Cage on the market for $28,500,000. If you are in the market to buy luxury home in Newport Beach please consult with us today at 949-444-1901 to see which is the right waterfront community for you.